On Wednesday, April 18, Dr. Abdulkhaleq Abdulla delivered a lecture on the second year of the Arab Spring as part of the NYUAD Global Studies Symposium. A professor of political science at UAE University in Al Ain and the 2005 Cultural Personality of the Year, Dr. Abdulla attracted some 50 members of the NYUAD community to the Downtown Campus for his talk and for the opportunity to ask questions. The prevailing tone of his presentation was one of optimism. He began by reviewing what he considered the primary accomplishments of the 2011 Arab Spring. These ranged from the more quantifiable fall of four entrenched dictators to the less tangible sense that “Arabs are now in the driver’s seat,” directing their own future. Turning to 2012, Dr. Abdulla first briefly gestured at the dynamic that he did not want to focus on, pointing out that the day-to-day battles and challenges in places like Egypt, Yemen, Syria should not distract observers from the overall positive regional trajectory. Without denying the obstacles ahead, he asserted the primacy of three encouraging “megatrends” and spent the remainder, and the majority, of the lecture sketching these dynamics. The common theme of the megatrends was reconciliation. First, Dr. Abdulla argued that the Arab Spring represents a reconciliation between global history, which for the past several decades has been moving toward democracy and liberalization and economic openness, and Arab history, sometimes labeled as immune to this tendency. No longer can people make such claims about Middle East and North Africa exceptionalism, the professor declared. The second reconciliation he noted is between Islamists and secularists, who are learning to accept each other’s political presence and to govern together. Finally, Dr. Abdulla spoke of a reconciliation between Arabs and the West. In his opinion, the Arab Spring broke the confrontational mindset of 9/11 and provided a common meeting ground, such that America is flirting with the Muslim Brotherhood in Egypt and Islamists are stepping back from their anti-American discourse. Many of the questions posed to Dr. Abdulla after the lecture interrogated his optimism. The general thrust of the queries was whether such optimism is wise when there is so much to be discouraged about, including the poorly covered uprisings in Bahrain and eastern Saudi Arabia, the region’s persistent economic disparities and problematic demographic trends, and the challenges of creating new constitutions. Throughout, Dr. Abdulla maintained his positive line. He clarified that he is most interested in the intellectual aspect of the megatrends and that although the future will be difficult, he chooses to be optimistic. 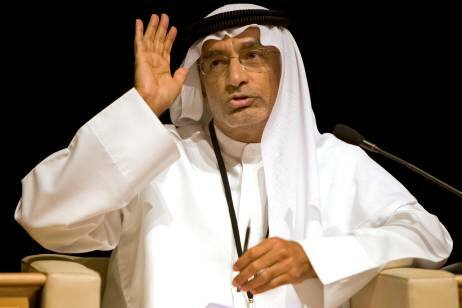 Questions also probed Dr. Abdulla’s view on the situations of the Arab Gulf states. Although not all countries in the Gulf have experienced street-level protests, he rejects the idea that they are exempt from the processes of change sculpting the greater Arab world. He affirmed that, like all Arabs, citizens of the Gulf states deserve to have more rights, more freedom, more meaningful elections, and stronger media. Moreover, he is sure that these things are coming and declared that the nations of the Gulf will be more democratic in the near future, with the UAE leading the way. Such a move toward democracy could augment the already weighty presence of the Gulf states in the Middle East and North Africa, a phenomenon which Dr. Abdulla has termed the “Gulf moment” in his writings. But, he pointed out in a post-lecture interview with NYUAD historian Dr. Andrew Patrick, if the Gulf does not make reforms in line with those of the burgeoning Arab democracies, this “Gulf moment” could be short-lived. Whether in the Gulf or the rest of the Arab world, a key factor for Dr. Abdulla in all these processes of change is that they come from within. As he said to Dr. Patrick, forced political shifts like those in Iraq will not be as genuine and lasting as those demanded and enacted locally. He suggested that in the wake of the initial uprisings, the next major event will be the establishment of a successful, self-driven democracy to serve as a model for the rest of the Middle East and North Africa. Especially with a regional example to look toward, Dr. Abdulla firmly believes that the new dynamics set in motion by the Arab Spring will only continue to gain momentum. Caitlyn Olson is a Global Academic Fellow at NYU Abu Dhabi.